We got a MacBook Pro in the shop today with a slightly unusual screen. This is a 15 inch MacBook Pro model A1286 like many of our customers have, but with one major upgrade. Instead of a standard LCD panel, this Mac has a “HD” LCD panel with a matte finish that’s easier to read and displays accurate colors. Before Apple came out with their newer Retina display technology, this was the top of the line. Some people still prefer these matte screens because they reduce glare. This MacBook Pro was in dire need of a Matte LCD Screen Repair. One feature of these Matte LCD MacBooks is that they lack a glass panel over the screen. Instead, they have a thin aluminum bezel around the edge of the screen. This one has been decorated with a cute little fish sticker! The benefit of this design is that there’s no glass to break, but the downside is the LCD panel is a little more exposed. Like all laptops, the screens on these MacBook Pros are susceptible to damage from drops, bumps, impacts, and rough handling. We’re not sure exactly what happened to this computer, but the screen is definitely cracked. There’s a clear point of impact on the upper right of the display, with lines radiating outward from a spot on the screen. There are also rainbow colored pink, green, blue, yellow, orange and purple vertical and horizontal lines staggered across the screen on top of the image and a grey bar across the bottom of the screen. There’s even a black section in the uppermost corner of the display. Not a pretty picture. Apple stopped making MacBook Pros with Matte LCD displays a few years ago, so they’re more rare now. If you have one of these models and your screen needs to be repaired, you’ll want to make sure to find a repair shop that has the matte screen replacements in stock. It’s not possible to switch between glossy and matte LCDs on these models, and they can’t be upgraded after the fact, so if you’re lucky enough to own one, you’ll want to take good care of it! We offer Matte LCD Screen Repair for your awesome piece of technology. An easy way to tell if your MacBook Pro has one of these matte “HD” displays is to look for the silver metal bezel part around the edge of the front of the screen. It looks very similar to the bezel that is on the front of the MacBook Air screens, but “MacBook Pro” will be printed on the bottom front of the bezel. We usually have the parts for these non-glossy MacBook Pro displays on hand in our shop, but it never hurts to call ahead and ask. For this customer, we were able to finish the repair and return the screen to it’s original condition within one day and under $300 dollars. The repair didn’t affect any of their user data or functioning of the machine. It was like the damage never happened! 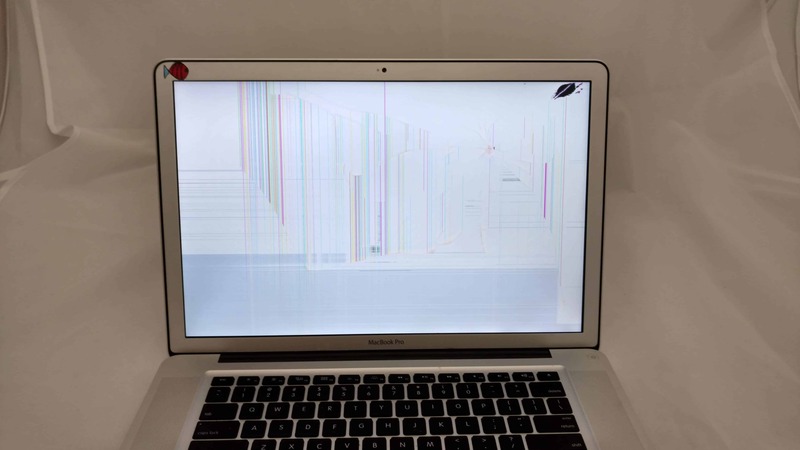 In addition to our matte LCD screen repair, we offer both LCD and Glass replacements for MacBook Pros. Take a look at our pricing on our MacBook Pro Display Repair page. Let’s get your MacBook Pro or MacBook screen repaired fast! Service all Nationwide in the U.S.